For some time, now, I have used vinegar for all my de-rusting. White vinegar works good but cider vinegar works even better. Seems to be a bit more aggressive I think. Vinegar is very cheap and safe to use. Recently rescued a 1965 Tiger Cub from a barn here in the states. Had been sitting there since the late 1970's when the owner moved from Ohio to the Pennsylvania country. I'm looking to do only a sympathetic restoration on this lovely bike so my work on it centers around cleaning the fuel system, changing out the oils and making it generally safe for me to ride. That's all. One of my first jobs was to de-rust the inside of the fuel tank. There was still gas inside. Not a lot but some. Enough to seize up the petcock so it would no longer work. I filled the tank with some 1.5 gallons of cider vinegar. Every few hours I changed the position it was resting in so as to reach all parts of the tank. Let it sit like this for two days and then drained the vinegar. I washed the inside of the tank with a jet of water and strained the spent vinegar through an old rag then poured it back in. Another few days and last night I poured out the vinegar for the second and, what turned out to be, the last time. 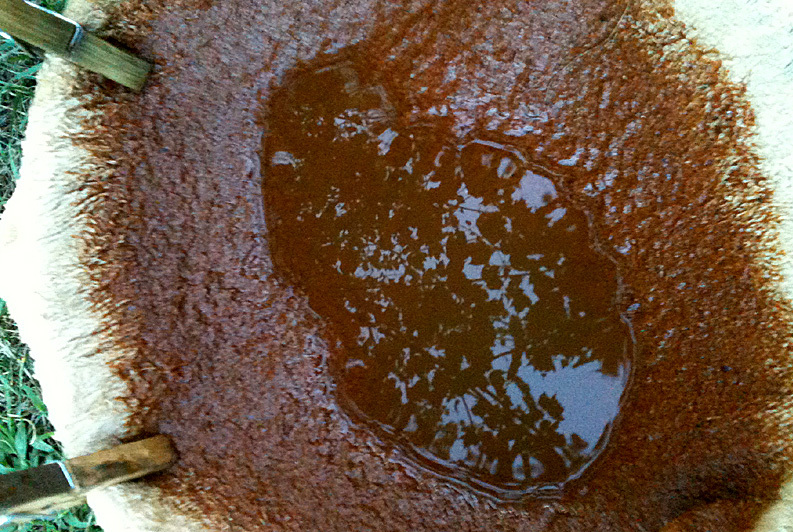 The picture below shows how much more rust the vinegar removed. The tank was now completely clean of rust. Spray washed it a few times and dried it with a hair dryer. I then poured in a few cups of WD40 and swilled that all around. That will sit for a few more days getting a few swills as I walk by the tank now and then. I'll drain off the fluid this weekend. That will probably be it. Don't think I will need to coat this tank. There is no pitting inside and no leaks. The WD40 should be enough to keep the rust away. BTW: Used cider vinegar on the rusted chain with similar results. Once clean and dry I set in a pan of old motor oil for a day then baked it at 300 degrees. Set it back in the pan for another day and baked it again once more. It's now hanging in my garage ready to go back on the bike this weekend. It may be different over there, but those tanks are very cheap here (compared to other Triumph ones) and yours has a big dent in it. I'd source anther tank and clean that? DAVE M2 wrote: ... and yours has a big dent in it. Same as I'd do, why throw the bike's history away? As above mate. Make it safe and ride it. Yes, just as I'm doing with my CL, make it safe and ride it. I found vinegar worked well in cleaning the tank as well, and am keeping mine as it came to me with dents etc. Just cleaning up the bits that I can, replacing what needs to be replaced , fixing what needs to be fixed, where I can. It's just all taking a long time. On hold right now because of holidays, weather and the death of my father, I just don't feel like doing anymore until the funeral is done with. hondapartsman wrote: Yes, just as I'm doing with my CL, make it safe and ride it. Service man returns to his home in Ohio, back from the Vietnam War, buys a used Cub. Probably all he could afford at the time. Repaints it and adds monkey bars like he saw in Easy Rider. 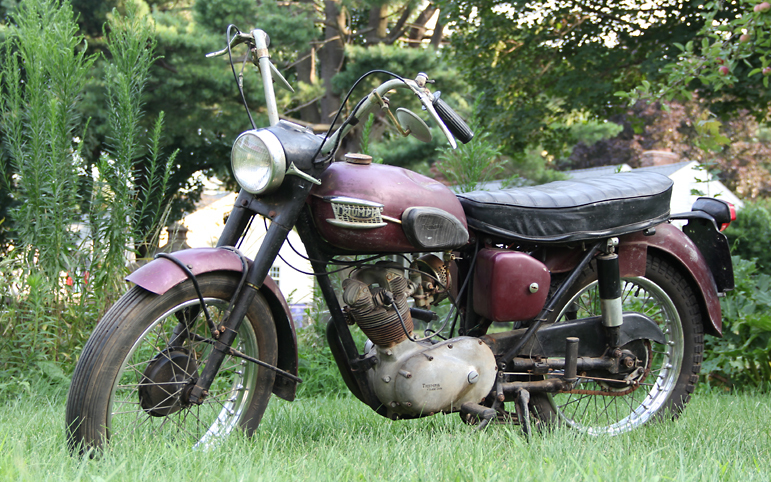 Sure like to see some clear photos of your bikes in their unrestored but ride-able condition. If a bike is fit to be used on the road I avoid restoring it. 1960 NSU Quickly, apart from cleaning and a bit of work to get and keep it roadworthy It's as it came out of the dump in 1980. 1958 BSA C12 bought earlier this year, a small hole welded up in the silencer and with a new battery fitted it sailed through the MOT test. Well in truth I might prefer to have lower bars on something like that I find my Ascot bars more than high enough, but each to their own. I'll see about the pics in due course, I have some but right now not in the mood to dig them out until after fathers funeral tomorrow.